Members of the Wolverines 12U Girls team attended the Cal-Berkeley vs. Washington NCAA college game on Saturday January 31, 2015. 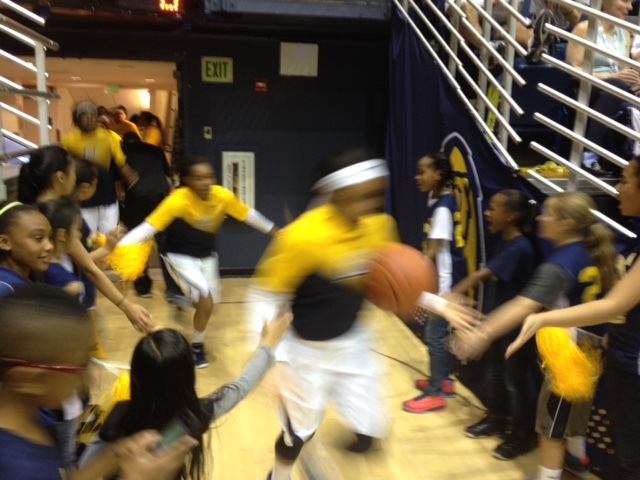 Our girls welcomed the Lady Golden Bears on the court prior to the team’s warmups. Cal Berkeley won 72-58 with Rashanda Gray leading the Bears with 27 pts and 14 rebounds. Coach Darryl Gorman led the outing and looks forward to seeing this youngest Wolverines team begin their journey in AAU basketball, following in the path of the strong Wolverines history in girls basketball. Many Lady Wolverines don Kimball High, Tracy High and Mountain House High uniforms, getting their start and honing their skills under the Wolverines in AAU basketball. Kimball players Sarah Nunes, Donwanae Anthony, Ally Schmidt, Bria Gorman, Jenna Kol, Daniela Barajas and Pearl Bautista, Tracy High’s Natalie Johnson, Jazzy Gonzalez and Katie Amaral, West High’s Taylor Herrera and Alyssa Febre are some of the more notable high school varsity players who have played with the Wolverines during their youth basketball days. 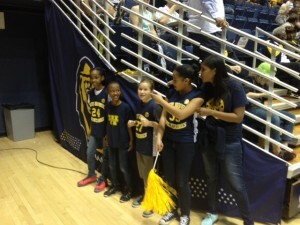 Half of the Mountain House High JV Girls team are Wolverines. 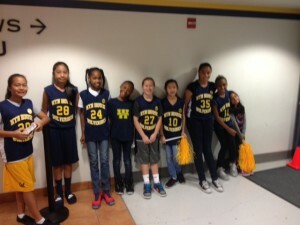 The Wolverines take pride in developing girl basketball players and this 12U Girls group hopes to continue this tradition. With the 2015 Spring season on the horizon, this team’s experience at Oracle Arena and now at Haas Pavilion gives this young team a front court view of what they achieve with hard work and determination.